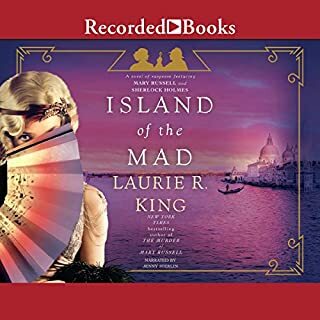 The wit, erudition and heart of Laurie R. King combined with Jenny Stirlin's beguiling and multifaceted narration deliver another fascinating listen in the Mary Russell series. Whether you are a longtime fan or new to the Russell stories, you will find much to savor in this story. It's a romp that takes Russell to London's Bedlam institution (posing as an inmate) and Holmes to meet Cole Porter at his Venice Palazzo (posing as an itinerant violinist). There is humor and suspense and a thoughtful look at issues of mental health, Fascism, and maintaining one's identity in the face of prejudice. Never disappointed by this series! Would you listen to An Argumentation of Historians again? Why? Yes, I occasionally listen to the entire series in order again; even though I know how a particular plot ends, I still laugh out loud at the writing and am moved by the character development. Zara Ramm does an amazing job differentiating the characters and her comic timing is impeccable. Jodi Taylor writes no two-dimensional characters, not even the villains or the bureaucratic martinets. 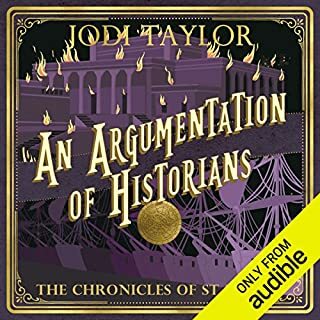 What other book might you compare An Argumentation of Historians to and why? Possibly the Oxford Time Travel series, though they are less humorous, but the characters take precedence over the plot, which I always appreciate. Every previous book in this series; I would love to discover other work she has done. I laughed frequently, and did get a bit misty in places, but having listened to the other offerings, I am confident that Our Intrepid Heroine will make it through. But if Jodi Taylor pulls a J.K. Rowling and kills off Dr. Bearstow, I will not be composed about it. Taking a chance on the first book in this series was one of the best impulse buys I've ever made. I would encourage anyone who appreciates thoughtful character development, clever and articulate writing, outstanding narration and screwball comedy in the same book (not a frequent occurrence in my experience) to start with No Time Like the Past.